Franchising in South Carolina is expected to employ nearly 138,000 people and have an economic output of $11 billion in 2018, according to data from the International Franchise Association. The forecasts are up 4.4% and 6.8% respectively from 2017. Women are finding their place in the franchise world. Nationally, between 2011 and 2016, female franchise ownership increased by 71% while male ownership is up 26%, according to FranNet, a franchise consulting service that has offices across North America. “Right now, about 30% of our clients in the Carolinas are women,” said Mike Hall, FranNet franchise consultant for North Carolina and South Carolina. “Any studies nationwide generally look like what we see.”Hall said it comes as no surprise to see the increase in women-owned franchises. “The majority of FranNet clients are mid- to senior-level professionals coming out of the corporate world,” he said. “If you look at the last 20 years, women, like men, go up through the corporate world then get laid off, or have reached as high as they will go. “As large companies grow and restructure, jobs may be eliminated. And there are more women in the corporate world, adding to that number,” he said. One of those women taking on a franchise is Rebecca Feldman, owner of Two Men and a Truck in Greenville. She got into the franchise business after working in nonprofit fundraising. She said the move was scary at first, but the personal freedom and flexibility she found made it worth it. Feldman moved from Atlanta 16 years ago to purchase the Two Men and a Truck franchise. “For me, when the kids were little, I was able to structure my schedule. That for me has been a wonderful aspect of owning a business,” she said. 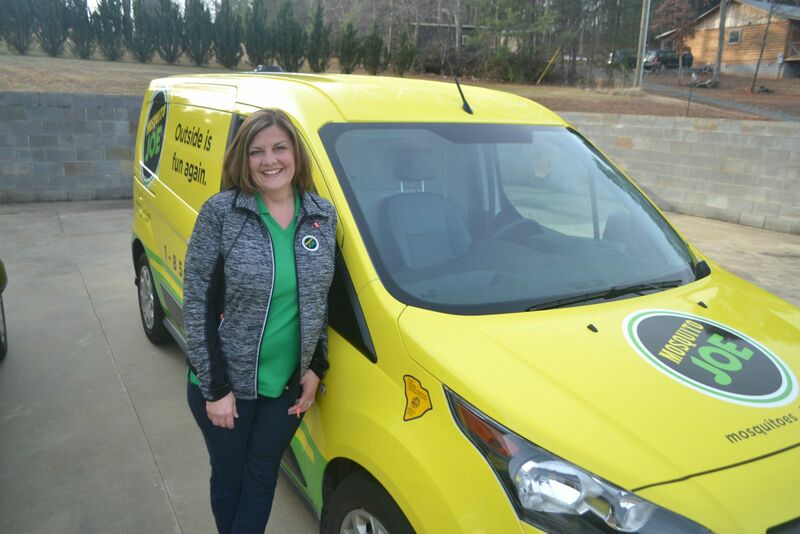 Since moving to Greenville, Feldman has increased her franchise ownership to operations in Tallahassee, Fla., and Richmond, Chesterfield and Charlottesville, Va. Since Jan. 1 she also added Norfolk and Newport News to her roster of franchises, and in March plans to open one in Beaufort. “It has really taken off for me. This was a good business decision,” she said. The opportunity for personal freedom also led Rita Blackwell to the franchise world. She is entering her second season as owner of Mosquito Joe and just moved the business to a new location along S.C. Highway 11 in Campobello. She had been operating it out of her garage. Her business covers all of Spartanburg County and portions of western North Carolina. Also has a contract with Spartanburg County District 1 schools.“The great thing about this is I could still do it at my home and look after my two little children” she said. The new 2,500-square-foot location for her business provides office space and storage space for supplies, as well as something extra. She said in this situation she can balance her family and have business success. Being part of a franchise also offers a strong support for business owners, she said. Hall said FranNet has helped women get into all kinds of franchising, including commercial cleaning, staffing and food-related businesses, among others. Feldman said she loves being a business owner. “I volunteer a lot, and this has allowed me the time to do that,” she said. She said anyone who is thinking of opening a business as a franchise should do their homework first. ← How Do You Innovate a Barbershop? Try a Great Clips Franchise.